WOODSTOCK, GA – 2017 marks fifty years since Kirk-Rudy,Inc.was founded in Libertyville, IL by Harry Kirk and Fred Rudy, both of whom worked together at the Cheshire Corporation in Chicago. Harry was Chief Engineer and responsible for many of the time saving features on Cheshire’s equipment, holding several patents on various methods and parts. When Cheshire was being acquired by Xerox in the late 60’s, Harry and Fred decided to start Kirk-Rudy, Inc. From the beginning, they planned to engineer and manufacture everything in house, not only to keep costs down but also to ensure quality control and performance, which to this day is what drives Kirk-Rudy stand out from all others. Kirk-Rudy’s headquarters in Woodstock, GA built in 2002. 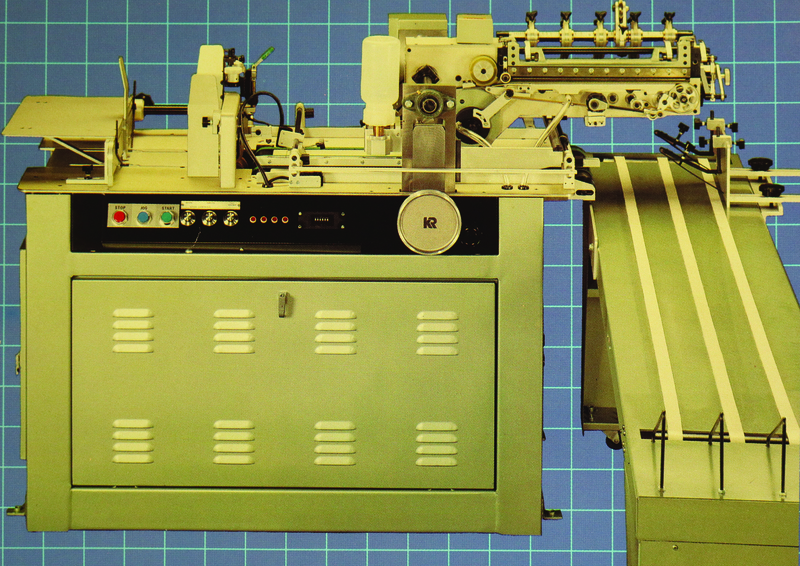 Their first creation was the KR201 imprinter, which was a unique flexographic printing unit designed for imprinting on calendars, catalogs, leaflets, etc. This imprinter became very successful in the U.S., and also sold in Europe through Chromos International. Their attention then turned to developing a line of address label and stamp applicating systems that were more flexible, easier to maintain and more affordable than those currently on the market. The KR211 labeler created and affixed individual labels from sheets of pin fed computer paper that contained multiple addresses. Harry Kirk was Chief Engineer at Cheshire. In 1971 Harry and Fred, along with a group of faithful employees moved the entire operation to a warmer climate in Kennesaw, GA, just north of Atlanta. At that time, several international dealers became interested in Kirk-Rudy’s equipment which resulted in rapid growth and expansion. Fred Rudy left the company in 1972. Shortly thereafter, Kirk-Rudy established their reputation as a leader in addressing and card attaching systems that were exceptionally designed and well built. Even the White House ordered a KR215 addressing system and it was installed in 1974. In 1975 Kirk-Rudy created an inserting system for the newspaper industry that was highly sought after. The demanding production environment of newspaper printing was no problem for Kirk-Rudy’s rugged construction and engineering capabilities. Kirk-Rudy continued to engineer equipment as postal regulations and technology advanced. A major development in1976 was a Zip Code sorting and stacking system which enabled mailers to easily prepare mail for bulk delivery into the postal stream. The KR215 Label Addressing system, the company’s first system solution. In 1991, their first tabbing system was created and quickly proved to be very successful. With continual development and new models being introduced, Kirk-Rudy soon became well known as a leader in tabbing equipment. In 2009, when the USPS changed their tabbing regulations and required a tab be placed on three sides of a folded booklet or self-mailer, Kirk-Rudy’s team of engineers immediately went to work and shortly thereafter created the world’s first tabbing system that applied all three tabs at the same time. The patented KR545T solved the problem of running tabbed pieces twice through existing equipment, or bringing two tabbing systems together to apply all the tabs. In the late nineties, Kirk-Rudy began developing inkjet printing systems allowing addresses to be printed directly on the mail piece rather than applying a label. Early technology included integrating HP’s Thermal Inkjet technology, which uses self-contained cartridges that include the ink and print head. Where it all started: Kirk-Rudy’s first plant in 1967. In 2002, the entire operation was moved to a brand new custom-designed 100,000 sq. ft. factory in nearby Woodstock, GA. At this modern facility, almost everything that goes into a Kirk-Rudy system is made onsite. A complete metal fabrication shop and machine shop provide the parts and hardware that are in every machine. A dedicated and highly trained team of nearly 100 people work under one roof to design and create all the equipment Kirk-Rudy has become famous for. Harry Kirk continues to this day in his role as active CEO, on the factory floor every day, making sure his vision for better and more efficient machine solutions continues into the future.